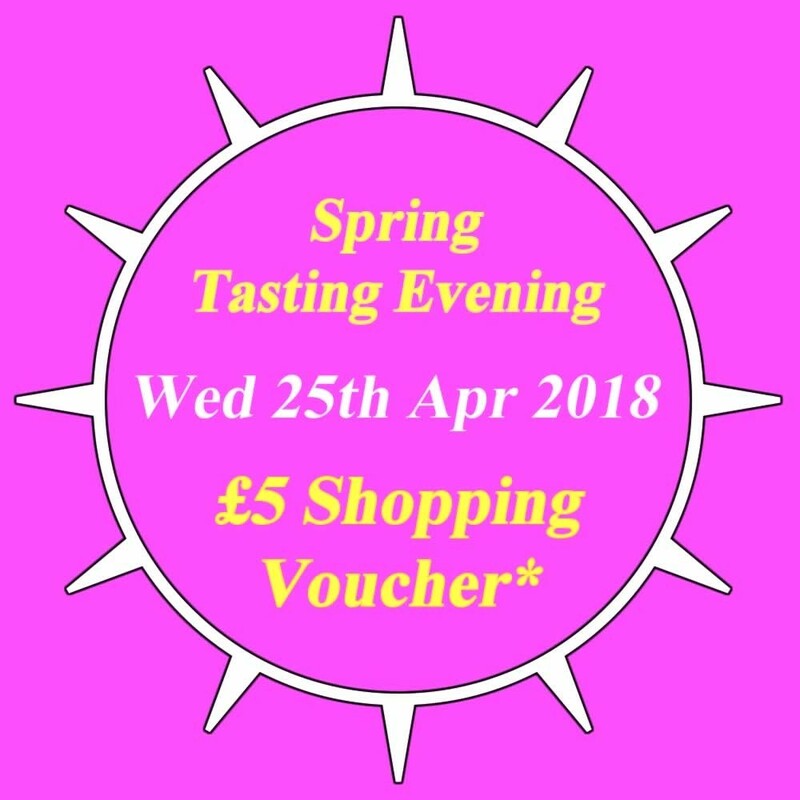 The Spring Tasting and £5 Shopping Voucher (25 Apr 2018) entitles the holder to attend our special Spring Tasting Evening on Wed 25 Apr 2018 in a Demijohn Store of their choice, and enjoy £5 off any purchase made during that tasting. Select your store, add the tasting to your basket and then choose the number of tickets you would like. Demijohn tastings are designed to be relaxed and fun. Your evening will be hosted by an experienced member of our Demijohn Staff and you will form part of a group of up to 30 like minded people who also enjoy unique food and drink. Our Spring tasting on Wed 25 Apr will be held concurrently between 6.30pm and 7.30pm in all 4 of our stores, located in Edinburgh, Glasgow, York and Oxford. The tasting evening format will be based on our standard tasting evening, starting with a cocktail or two followed by a guided tasting of some of our 80 unique food and drink products that we now sell. It will be your chance to learn a little more about some our more unusual products and hear a little about how Demijohn was founded and exists today. At the end of your tasting you will have a chance to purchase some of your favourite products, using your £5 Shopping Voucher. Please note your shopping voucher must be redeemed during your booked tasting evening. If we are unclear about your choice, do not worry, we will make contact with you prior to your event. We will also send a reminder to you by email prior to the date of your tasting to ensure you are ready for your fun evening. We are running an additional Spring Tasting Evening on Thurs 19 Apr 2018, if this date is not suitable. Cancellation - Should you wish to cancel your Tasting and £5 Shopping Voucher please tell us as soon as possible. In order to qualify for a refund, you must have informed us of your wish to cancel 7 or more days prior to the tasting. If cancellation of your booking is made by us within 7 days of the event we will offer an alternative date for a tasting or offer a full refund for your purchase in the event that the alternative date is unsuitable to you. £5 Shopping Voucher - Your £5 Shopping Voucher can only be redeemed during the booked tasting, and must be redeemed in a single transaction in full. No refund will be given in the event of the voucher not being used, or it only partially being redeemed.